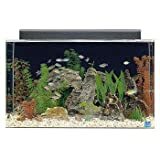 Constructed of the finest cast acrylic, a SeaClear Aquarium Combo will offer years of dependable service. It’s less than half the weight of comparably sized glass tanks and its exceptional clarity allows unobstructed views of the underwater world you create.Acrylic is 17 times stronger than glass and other commonly used aquarium materials.SeaClear Aquariums are all acrylic, with no degradable sealers. Seams are molecularly bonded and heat polished, not joined with glue or sealers. This means your SeaClear Aquarium will be virtually leak and breakproof.Because acrylic is impervious to the corrosive effects of saltwater, SeaClear Aquariums are safe for both fresh and saltwater use.Includes a fluorescent light fixture (bulb not included) and manufacturer’s lifetime limited warranty. This entry was posted in Aquatics and tagged Aquarium, Blue, Combo, Rectangular, SeaClear by One Boutique. Bookmark the permalink.